On Thursday the most interesting by-election of this Parliament takes place. Eastleigh, recently vacated by the disgraced Chris Huhne, sees the two Coalition parties fight it out. It is a Liberal Democrat stronghold, held since 1994. Even Labour’s 1997 landslide resulted in only a third place with 26.8 % of the vote. This by-election raises issues for left-leaning voters. Who do you vote for when the only real contenders are in Government delivering policies that are diametrically opposed to your principles? This is the dilemma that First-Past-The Post poses across the country. It turns the decisions made in elections from working out the best choice to calculating the least worst. Framed in this fashion then, what is a Labour and Green supporters least worst option, assuming your priority to to remove this Government? The answer is quite clear – vote Liberal Democrat. That’s right – vote Liberal Democrat. In 2015 the Liberal Democrats will be fighting 57 seats. Of these, in 38 the Conservatives are the second place party and Labour are runners-up in 19. Below is a table with the effect of different swings from the Liberal Democrats to the Conservatives and Labour on the seats that Liberal Democrats would lose. For example, should the Conservatives get a swing of 5% from the Liberal Democrats in these seats, they would take 15 seats. Should Labour get the same swing in the same seats, even a static Conservative vote would result in no gains whatsoever. The end goal of removing the Conservatives in 2015 is hampered seriously if the Liberal Democrats lose ground in the south, south east and south west where Labour are not contenders. Every seat the Conservatives win makes the job of Labour harder. By-elections since 2010 strongly suggest that the Liberal Democrats have suffered serious swings to Labour, enough to virtually eliminate them from most urban areas, the north and the regions. Labour have also gained on the Conservatives. So if you live in a seat Labour are a poor third, allowing the Conservatives win by not voting Liberal Democrat really is cutting of your nose to spite your face. Perhaps you should try one of Polly Toynbee’s nose pegs? Economics needs its Reformation, not only a new theoretical basis, if one can be found, but more importantly, the financial economy needs to be taken out of the hands of a small and overly powerful clique – a clique which, like the Church of Luther’s day, has been shown to be not only corrupt but criminally incompetent in the very matters in which it claimed to have special insight and expertise. Economics in the twenty-first century is in the grip of the very same mind-set that impeded any possibility of intellectual progress in the 16th century and now stands in need of its Nicholas Copernicus, its Giordano Bruno, its Galileo and its Johannes Kepler. In the same vein, Professor Richard Wolff told Bill Moyers (in the excellent video interview below) that he had to go to a Business school to learn how real world economics works because it wasn’t what was being taught in the elegant equilibrium models of the Economics Department at Harvard or other prestigious Universities. Professor Steve Keen goes further by saying that there is ‘a paradoxical but transcendental truth’ – Neoclassical economists don’t understand neoclassical economics. The problems outlined are pretty damning. We are told that ‘there is no alternative’ (Mrs Thatcher’s TINA) .. and yet it is an economic system which doesn’t predict real world events like the financial crisis in 2008; that the real world throws up endless evidence that the model is utterly wrong; that economics in the twenty-first century is in the grip of the very same mind-set that impeded any possibility of intellectual progress in the 16th century; and that since this theory fits with the views of those with the money and power, it is funded and propagated. Moreover, a system which doesn’t serve society, is justifying ‘austerity’ policies and leaves ‘Greece effectively stretched on the rack, we have unemployed living in pipes, and the Spanish youth left to wander the streets scratching a living and their heads’. How is this dire state of affairs possible? Some of the body of mainstream theory was applicable to the convertible, fixed exchange rate currency systems that were defined under the Bretton Woods system. Under that system, the government was revenue constrained as a result of the link between currency on issue and the stock of gold held by the central bank. As a consequence, the government had to raise taxes and/or borrow from the non-government sector in order to spend…. By the 1960s, a series of what were called “competitive devaluations”… were made and set up a series of leapfrogging actions among trading rivals. The system collapsed soon afterwards when it became obvious that the US government could not longer support it. The system is ‘a complex web of inter-related myths’. But is there only one strand of economic thought or are there different schools? 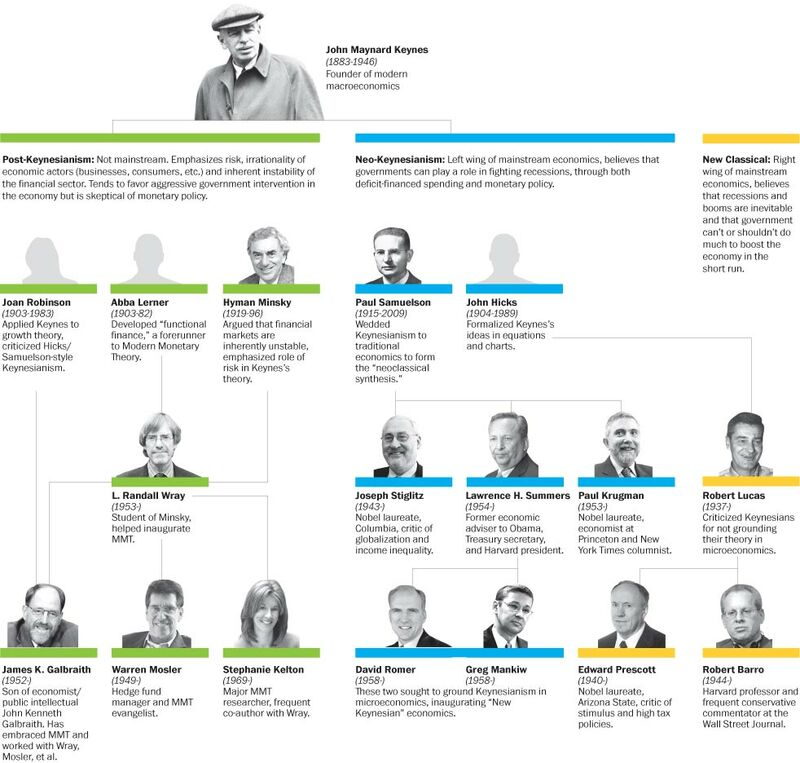 For the mainstream, the disputes are solely between the Neo-Classical economists and the Neo-Keynesians. But there are also the ignored Post-Keynesians. Professor Bill Mitchell is a notable omission from the Post-Keynesian list above but that may be because he is Australian. Professor Steve Kean is also missing from the line under Minsky (but that may be because he is also Australian). ‘I have noted in the past that the body of theory we call neo-classical (characterised by marginal analysis) emerged in the fourth quarter of the C19th as a counter to the growing popularity of Marxist thinking and the threat it was posing for the wealthy capitalist class. Industrialists provided funding to economists of the day to develop a theory that would show capitalism to be “fair”. This was the basis of marginal productivity theory, which claims that all rewards taken from the system are in strict proportion to the contribution the recipient makes to the production process. The theory has survived despite being internally inconsistent… and lacking predictive capacity. Neo –Keynesianism arose out of a synthesis of Neo-classical economics and Keynesianism. A leading architect is Professor Gregor Mankiw, Professor of Economics at Harvard University, former chairman of the Council of Economic Advisers under President George W. Bush and in 2006, an economic adviser to Mitt Romney and continued during Romney’s 2012 presidential bid. I think it is pretty safe to say that Mankiw is not a Democrat. He is also author of the mainstream undergraduate textbook Principles of Economics. As Chris Waller writes, in economics just as in the 16th century church, ‘those who wield power will do their utmost to stifle anything which they regard as heresy’. The hawks are the austerians who argue government deficits are too high, so we must cut expenditure fast. Government should get out of the way and let the private sector do what it does best. George Osborne and chums are definitely in this category. The doves argue that the private sector is very weak at the moment, unemployment is high and so we must temporarily increase spending to stimulate the economy. They would agree with the hawks however, that generally, large deficits are bad and so we need a medium term strategy to get the deficit down. Paul Krugman is probably the most famous deficit dove, but over here, economists like Jonathan Portes fall into this category, and also maybe Ed Balls (although he often sounds like a hawk). But what about the Modern Monetary Theorists and Post-Keynesians? Richard Wolff (and many others) emphasise that mainstream economics is not working, and does not reflect the real economy. Furthermore, as Chris Waller (and many others) say ‘the financial economy needs to be taken out of the hands of a small and overly powerful clique’. These are pretty huge indictments. We can have jobs for all and sufficient income for all. There is no need for poverty. And very likely without having to ‘tax the rich’ either. So we all win. Let’s harness the output we’re leaving on the table. Let’s stop chopping people’s feet off to fit the New Procrustean bed. Economist Richard Wolff and Restaurant Worker Advocate Saru Jayaraman talk about battling rampant capitalism, and fighting for economic justice. The recent downgrading of the UK by Moodys from it’s AAA credit rating will certainly create problems for the Government. It will make little difference to the UK financially. The UK’s financial position is well known and money markets will have been building this into prices for some time. Similar downgrades in the US and France have not made a real difference to their borrowing costs. However, the Chancellor and the Government have had their credibility damaged. The perception of lost credibility is very dangerous, and once lost is hard to get back. In September 1992, just months after a remarkable election victory, Black Wednesday damaged the Major Government permanently. George Osborne was already looking in a poor position, with his Austerity programme being stretch way beyond the period promised in 2010. Growth has stalled badly. What is clear is that the Conservatives have been in free fall since around March 2012. This is a reference to the ‘omnishambles’ budget, and they have not recovered since. What is also noticeable is the fact the Labour has not felt any benefit, merely moving from 26% in June 2010 to 28% in February 2013. The notable beneficiary of this has been ‘None’, moving from 7% to 13%. Quite simply increasing numbers of people feel that no party offers any prospect of improving the economy. They have lost faith in the Conservatives, but don’t feel Labour offers anything better. This finding is demonstrated by the correlation between the Conservative figure and the none figure (-0.75). The correlation of the Conservative to the Labour figure is a much worse -0.29. The outlook for the UK economy is currently poor for the next few years. There looks to be no prospect of a change in economic fortune that would restore credibility back to the Conservatives. Our main trading partners in Europe are suffering very badly, and the overall picture is one of bouncing along the bottom of a long period of low or no growth. Labour does have a open goal here, if they can have faith in plan not based on Austerity, but one of serious and sustained investment. The last few months has seen some speeches where Ed Miliband has begun to articulate an alternative, yet this embryonic economic plan needs much more flesh and bone. This plan cannot be Austerity-lite, but something different. The price of not creating and articulating this vision could be to enter the next election giving the Conservatives a chance it simply does not deserve. Labour failing to beat the Conservatives in 2015 would be unforgivable.